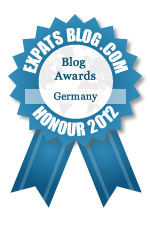 ExpatsBlog.com Expat Blog Awards 2012: Germany Honourable Mention Award! This blog won the Honourable Mention Award for best expat blog in Germany! Two-fisted tales of Teutonic terror!! Smart and funny - if Dave Barry had married a German, this is probably how his blog would look. Funny and fresh and irreverent. What's not to like? I especially enjoy the pictures that lead off the blog. It is so fun to look at Germany from the eyes of an ex-American. Always makes me smile and often allows me into his thinking and the learning process he is going through in his new land. Creative, funny, and original. It even inspired me to start my own German-American blog! Such a fantastic blog! Every time I wander over it ends in laughter. As a fellow ex-pat I can totally relate to some of his experiences. Not to mention that it's nice to know that I'm not the only American navigating life in this strange land with a slightly warped sense of humor. Love it! Never ceases to make me laugh -- often to the coffee-snorting stage, which is my personal Gold Standard! Oh God my Wife is German is a great, quick, funny and informative expat blog. I also live in Germany and I giggle everytime I read one of the updates. Absolutely fantastic blog. Reading this blog from a German stand point and understanding the language differences is just hilarious. Funny and poignant at the same time. I "feel the love" between these two people and laugh at the same time. I've shed tears and nearly peed myself. This blog is FUNNY! This is always funny, and will make anyone who has a vague knowledge of Germany smile! One time I was reading this blog while eating spaetzle and it shot out my nose. Now I am much more careful about what I'm consuming while reading it. Mostly I stick to milk. A truly excellent blog. Funny, with a touch of Portland weirdness (who writes about how his wife's pee smells? Someone from Portland, that's who). It's been nice to read the impressions of another expat.